Accountability practices, intended to increase trust in NGOs, can lead to a narrow focus on projects at the expense of engaging in wider campaigning for social transformation. The Vienna Policy Conference, October 29-30, 2015, will delve into one of the most important trends driving change in European politics: the dramatic drop in public trust in many political institutions. Policy researchers, activists, leading European thinkers, and political figures will discuss new research and analysis of the causes and consequences of the trust gap across the European continent. Debating Europe and openDemocracy will be covering the event and its follow-up, and we continue this series with Armine Ishkanian’s thoughts on the challenge facing NGO’s worldwide – to rebuild trust, in themselves. Protests outside Downing St.after closure of Kids Company. Demotix/Johnny Armstead. All rights reserved.One of the big news stories in the British press this summer was the spectacularly rapid decline and closure of the once celebrated, high profile NGO, Kids Company. This NGO, at one time widely feted by politicians, businesses, celebrities and royals, abruptly closed its doors on 5 August 2015. Its affairs are now under investigation by the Metropolitan Police, the National Audit Office, the Charity Commission and there is even an inquiry by the House of Commons Public Administration and Constitutional Affairs Committee. Alongside this huge media spectacle, there was the story about an elderly woman who, her relatives claim, was driven to commit suicide after being “hounded” by dozens of charities seeking donations. On a regular basis meanwhile, the mainstream media publishes articles expressing “outrage” about the six figure salaries of NGO executives. To be sure, all these stories refer to a subset of large, professionalised NGOs in the UK and there are thousands of smaller, less well-funded organisations whose leaders do not receive six figure salaries and are not honoured by politicians and royals. Yet the increasing appearance of such news stories about NGO misconduct (alleged or proven) has contributed to a declining public trust in these voluntary organisations in the UK. So, while trust in voluntary/third sector in the UK remains higher when compared to other sectors, it is important to assess this decline and its wider implications. Of course, the criticisms and questions about NGOs legitimacy, representativeness, and accountability have been around for years. But, while the examples cited above all refer to the UK, the growing scrutiny of NGOs today with the accompanying decline in trust is a global phenomenon, and this is new. In 2013-2014 my colleagues and I conducted research in Athens, Cairo, London, Moscow and Yerevan to examine the rise of pro-democracy and anti-austerity movements which have become sites for political action, resistance, and solidarity. We studied the transnational diffusion, local specificities, wider impact of protests on political developments, as well as the relationship of movements with other civil society actors, including trade unions, political parties, and NGOs. Today we see two separate and opposing critiques directed at NGOs. First, with the continued downsizing of the welfare state and the opening up of public services to NGOs and other non-state actors, it is important to consider what happens to the transformative agendas of NGOs when they become involved in the delivery of services. With their increasing role in service delivery, NGOs face pressures to be more business-like, to strengthen their management structures, and to become more enterprising and innovative, all whilst providing ‘better value’ for money. They are expected to work in partnership with the state and to stick to the core business of delivering services. While some types of approved, technocratic, non-confrontational advocacy and campaigning are permitted, more contentious forms of action are very often frowned upon and rejected. Governments want NGOs to “stick to their knitting” and to avoid playing politics. On the other hand, as we discovered, many activists involved in protest movements criticised NGOs for being co-opted, tamed, corporatized and overly focused on their narrow organisational interests. Some went so far as to argue that NGOs were the handmaidens of corporate, neoliberal capitalism. Activists argued that by emphasising their own projects, grants and contracts, NGOs have lost their way and are not leading the struggle against poverty, structural inequality and exclusion. We found that while individual NGO employees often supported and even joined protest movements in their individual capacity, creating organisational level relationships was far more problematic. Given these criticisms and the conflicting demands and pressures, what can NGOs do? Some scholars have suggested that if NGOs want to “make a difference”, they should work more closely with movements and activist groups. We maintain that if we solely focus on these critical stances, we run the risk of ignoring the broader, more complex set of interactions between NGOs and movements which exist alongside and which we characterize collectively as ‘surreptitious symbiosis’. We discovered that while there were behind the scenes interactions and the involvement of individual NGO employees in movements, more public forms of engagement and collaboration were not easy to sustain. The problem was not in initiating contact or establishing dialogue, but rather in finding productive and mutually acceptable ways to develop and sustain a working relationship over time. First, there is the matter of very different institutional demands facing NGOs and movements. As recipients of grants and contracts, NGOs must report to donors and as mentioned above, to demonstrate their level of professionalism, effectiveness and efficiency. There is nothing wrong with this and it is important for NGOs to give an account of the funds received and spent. However, to maintain accountability at the standard now expected by most donors, NGOs must engage in a substantial amount of monitoring and evaluation which includes identifying indicators, measuring impacts, collecting information about project outcomes, and reporting on their work before, during, and after the end of the project cycle. Such accountability practices, which are intended to increase the trust in NGOs, require significant investments of time and human resources meaning that if an organisation’s core work is not advocacy, at times such pressures can lead to a narrow focus on projects at the expense of engaging in wider campaigning for social transformation. Movement activists do not face these strict reporting and accountability requirements and they are freer to engage in more contentious forms of direct action. We found that sometimes activists do not fully appreciate the pressures NGOs face, which leads them to criticize NGOs for being too complacent and timid. Second, NGOs and movements have very different organizational cultures and forms of communication. While the latter tend to focus on horizontal, loose structures and inclusive patterns of participation, NGOs tend to be more formally organised and hierarchically structured. 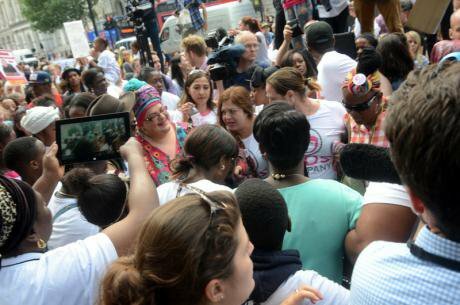 In one case where a NGO attempted to build an alliance with a movement to campaign on a particular issue, the activists were initially invited to meetings at the NGOs’ office in London to discuss tactics and strategy. This culminated in a series of coordinated public actions that drew greater public attention and media coverage to the issue. However, once the NGO applied for and received funding to pay for a fulltime campaign manager, the relationship began to sour. The campaign manager began to question the level of involvement by the activists. He stopped including them in strategy meetings, which were now attended by other NGOs working on that issue, and he also complained about having to spend so much time listening to the lengthy discussions of activists. Thus even when there is a desire to engage, it isn’t always easy to do and there must be willingness from both sides to compromise, adapt, and to find mutually acceptable forms of communication and engagement. Finally, there is the question of the wider aims and objectives of civic activism. What is the purpose or role of NGOs in society? Is it to fill in the gap of the receding state and to provide a residual safety net to vulnerable members of society, or is it to challenge and transform the structures that perpetuate poverty, inequality, and social exclusion? To be clear, these are not necessarily mutually exclusive. But as I discussed above, achieving this requires a certain will and commitment. Facing increased scrutiny and criticism, from politicians, social movements, the mainstream media, and the public, NGOs must reevaluate their aims, values and wider purpose. Will they become more business-like and focus on delivering welfare services efficiently and cost-effectively while leaving it to others to tackle the wider political issues? Or will they align with social movements to promote a more transformative agenda? Despite the multiple pressures facing them, NGOs have a choice, they have agency. It is time that we had a bigger public conversation about the role of NGOs in society. What purpose do they serve? Whose interests do they promote? Can they help democratize politics? And finally, how can they re-gain and build trust? For the sake of simplicity, I use the term non-governmental organisation (NGO) to refer to all professionalised, formally registered voluntary and non-profit organisations.